There have been so many technological advances to the dental industry in the last few decades, all of which we excitedly tout. It's fun to talk about all of the stuff that we can do to your teeth to make them better, stronger, faster - well, maybe not faster. 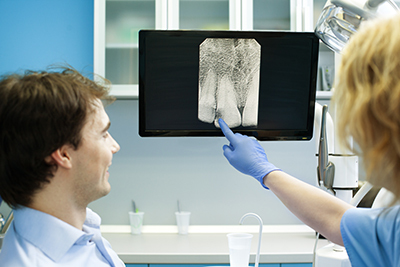 Sometimes some of our most incredible tools go unnoticed, like the digital X-ray. This machine came along and completely revolutionized the dental industry and here's how! It used to be a chore to have X-rays done. The patient would come in, we would set them up at the X-ray and place a big lead vest over them to protect them from the radiation. We would take the X-rays and have to wait for them to develop. Then, after a long wait, if we found out that they were inadequate or flawed in some way, the whole process would need to be repeated. Digital X-rays expose the patient to 1/5th the amount of radiation that a normal X-ray does, allowing us to offer you a much safer experience. Not only are they more safe, they are much faster. When we take a digital X-ray we can view it in a few seconds! If they need to be retaken, we know right away and it only takes a minute. The image only takes a few seconds to show up and when it does, it shows up on a computer screen, in high definition. We can use this image to share with you the issues we find in your mouth so that you can change your oral hygiene habits accordingly. At Mahar Dental we believe that your education on how to best take care of your mouth is paramount. When you can see the things taking place in your mouth and are given a decent understanding of how to remedy them, you will be able to prevent future issues. Please contact us if you have any questions about digital x-rays.